Most of the new/old retro toy film cameras that come out nowadays bore me to death, but this one is actually pretty neat. It's a hand-made pinhole camera that takes pictures on Polaroid instant film, creating distorted but magical views of the world. It's made by the same people who brought you the Impossible Project, and it's called the 66/6 Pinhole camera. Hand-made in a limited edition run of 500, this thing is unfortunately costly at $275 a pop. As in all pinhole cameras, the 66/6 lacks a lens or a mechanical shutter. It relies on your finger to act as the shutter, with exposure times based on some simple photographic calculations you can figure out with an accompanying app. 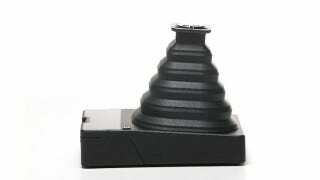 The camera has rubber bellows that move back and forth for photographic subjects at various distances. There are two sizes of pinholes to accommodate light levels. It's definitely a different experience than pointing and clicking, and you truly never know what you're going to end up with. It looks like a lot of fun, and pretty unique, for a pinhole camera, to be able to see your results instantly. What impresses me is the gallery of sample photos on the project's website. They look genuinely interesting, as opposed to many retro toy cameras which kind of look like a bore most of the time.